Three years ago, who would have thought that you can pay your bills, make bank deposits, buy load, and send money using your mobile phone? With GCash, pwede pala! Gone are the days when you have to get out of your home or sneak out of work during breaks just to make a last-minute bill payment at the bank or at a payment center. 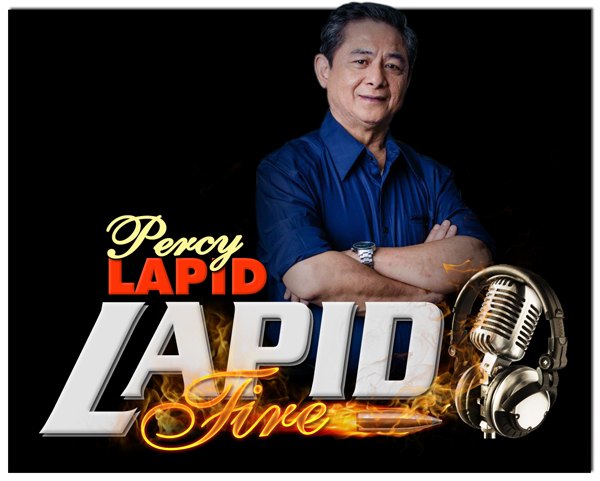 Filipinos nowadays are looking for convenience, efficiency, and availability. “We are trying to solve the problem of access to basic payments and financial services for Filipinos. Nearly 7 out of 10 do not have access to a bank account, 34% of municipalities do not have a physical bank branch, 90% of the population does not have formal credit. This is what we want to work on and hopefully make a positive impact,” said Anthony Thomas, Mynt President and CEO. He believes that there are still a lot to be done in the Fintech space in the Philippines even as he expressed optimism that by disrupting traditional channels through digital financial technology services, Mynt would be able to provide financial access for more consumers and merchants, and organizations. It was not too long ago in an 8-seater storage room, inside the then newly constructed Globe Tower in Bonifacio Global City, that the concept of enabling the aspirations of the financially underserved was conceived. Most Filipinos do not have access to various financial services: Nearly 7 out of 10 Filipinos do not have access to bank accounts, about 95% have no credit cards, and about 40% do not have access to physical banks. These make life more challenging for your average Juan dela Cruz, whose daily wage just hover around P500, to have spare cash to access better financial services, as opening up even the most basic credit card line costs a hefty P10,000, not to mention all the time one will consume to get it. However, the market is ripe for digital disruption because of a high mobile penetration and a thriving young population. Inside that very storage room were a handful of willed employees proposing a solution to address financial inclusion in the Philippines. Thus, Mynt was born. Mynt was a company established in 2015 as a strategic partnership between Globe Telecom and the Ayala Corporation for the realization of a cashless nation leading to finance for all. Later in 2016, the Chinese mobile wallet giant Ant Financial (Alipay) came onboard, strengthening Mynt ‘s positioning in the country as it operates GCash and Fuse Lending, Inc.
Mynt provides innovative and relevant fintech solutions to consumers, merchants, and organizations. Its vision is to enable financial access for consumers and merchants by disrupting traditional channels through digital financial technology services. They are able to put forth these solutions by actively listening to customer feedback and leveraging on the technological expertise and knowhow brought by Globe and Alipay. 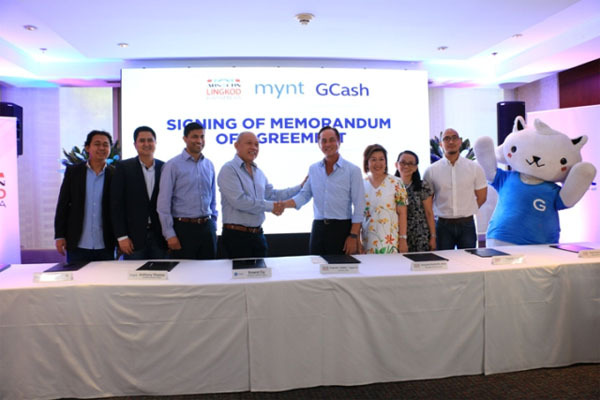 Mynt operates two other companies: GCash, the leading mobile wallet in the Philippines, and Fuse, a microlending company that extends small loans to Filipinos for as small as P1,000 via GCash through GCredit. These services are readily available to any Filipino that has a bar phone or smartphone that will register to the service. The GCash App is the country’s leading mobile wallet, growing exponentially to 15 million registered users nationwide in just three years. It has been awarded the Best Mobile Payment App of the Year in 2017 by The Asian Banker, and the Best Mobile Payment Service Award by the Telecom Asia Awards in 2018. It’s also the leading finance app in the Google Play Store since 2015. Originally a platform where a customer can buy prepaid airtime credits, send money to other GCash users, and pay bills without going to a payment center, the GCash App have rapidly developed to become a lifestyle app. It now has the ability to – on top of being able to scan to pay using GCash QR – book movies at partner cinemas, pay directly on Lazada, pay using credit (via GCredit), invest in money market funds, and even lets Alipay users in Hong Kong directly send money to GCash users in the Philippines. As a new feature, the GCash App can also send money directly to 30+ partner banks, including BPI, BDO, RCBC, Unionbank, and Metrobank, to name a few, free for a limited time only. Anyone can download the GCash App and register for a GCash account. With its multiple features, customers are realizing that they can solve their pain points through the app. Bong Yusingco, a worker from Quezon City, was previously receiving his son’s remittances from a brick-and-mortar remittance center, but is now using GCash exclusively. “Pinadalhan ako ng pera ng anak ko pambili ng gamot, dahil sa GCash walang bayad magpadala. No hidden charges, di nabawasan ang pera ko,” he said. Justine Concepcion, an employee in Taguig, also utilizes the GCash App for other uses aside from money withdrawals. “Any payment has been easy since I used GCash. I can pay my bills and enjoy my shopping without bringing my wallet! Not only that, I can withdraw money using my GCash Mastercard without getting charged,” he said. Customers without the GCash App can also register by dialing *143# on their bar phones then looking for GCash, or by opening their Messenger App and searching for @gcashofficial. GCash sa Palengke, Taxi at Tricycle, pwede pala. Recognizing the challenges faced by the unbanked, Mynt set out to develop and sustain GCash ecosystems around the country. 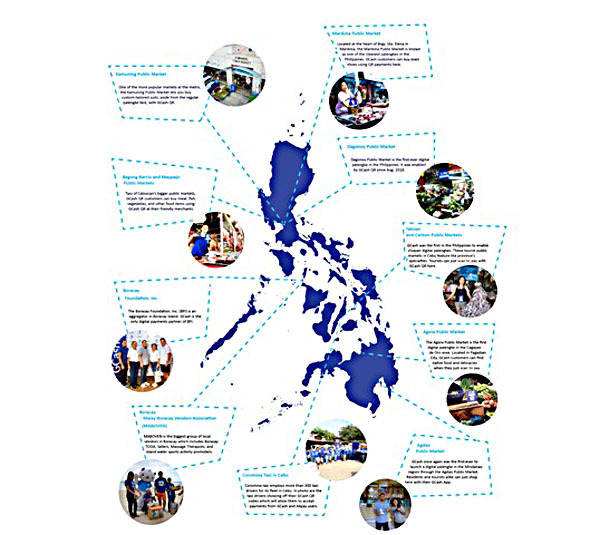 GCash now has over 30,000 QR merchants in the Philippines, with a 137% QR payment growth versus its December 2017 base, scattered around malls, independent establishments, sari-sari stores, and ambulant vendors – from taho vendors, to sorbetes vendors, to balut peddlers. To further build the GCash ecosystem, the company have started tapping grassroots-level industries in the transportation and retail sectors. The NEW ROTODA, the biggest tricycle transport group in Rodriguez, Rizal at over 1,350 members, have already started accepting GCash QR payments. Mike Alvarez, a board member of the NEW ROTODA, was very excited to launch with GCash and to be able to accept GCash QR payments. “Masaya ang buong NEW ROTODA kasi biruin mo, pwede ka na magbayad sa tricycle gamit yung telepono mo lang. Pinakaproblema kasi namin parati e yung barya, pag walang panukli, magpapapalit ka pa, tapos ganun ulit mamayang tanghali, mamayang hapon. Dito, eksakto yung bayad e. Tapos kahit wala kaming bangko, lahat ng pera namin mapupunta sa GCash, tapos pwede naming kunin sa mga ATM o sa mga GCash partners,” he claims proudly. Mynt, through GCash, was the first to enable digital payments with a tricycle association in the Philippines. Tricycle rides in the country usually cost anywhere from P8 on shared rides, and up to P40, on solo rides. The challenge for tricycle drivers, and on the same vein, jeepney and UV Express drivers, is change for passenger payments. When a driver has no coins or smaller bills, and a passenger pays with a bigger denomination, the driver will have to scramble for change before the passenger needs to alight, else he’ll forgo the transaction and return the bill, essentially giving the passenger a free ride. With GCash, exact payments always happen. GCash has recently enabled one of the biggest taxi operators in Cebu. Coromina Taxis now accept GCash for the hundreds of taxis in its fleet in the Queen City of the South. Locals and tourists can pay using their GCash through Scan to Pay payment technology. Another opportunity Mynt is exploring for financial inclusion are the palengkes. The company was the first in the Philippines to launch digital payments in public markets. Currently, there are 11 core palengkes nationwide that accept GCash QR, with more locations rolling out in 2019. GCash customers can conveniently shop in GCash Palengkes: partners range from meat, poultry, fish, vegetables, and many more. “Mula ngayon, ang ating mga mamimili at ang mga manininda, ay pwede nang gamitin ang GCash para sa mas simple, mas safe, at mas convenient na pamamaraan ng pagbayad. Ngayon ang simula,” said JM Aujero, Mynt’s Vice President for Merchant Solutions, pertaining to Mynt’s financial inclusion drive in palengkes. With QR payments, payments will go directly to a merchant’s GCash account, which in turn would allow them to use a multitude of GCash services, including being able to send money to their loved ones nationwide in a few seconds for free, or send money to 30+ partner bank accounts. They can also directly withdraw their money from ATMs using their GCash Mastercard, or use the same card to access functions they weren’t able to use before, like swiping to purchase at malls. These features give them the same ability as someone with a credit card, or someone with a bank account. In Boracay – A cashless beach getaway. Pwede pala. GCash seals partnership with Malay Boracay Vendors Association (MABOVEN) to empower taho vendors, hair braiders, fruit sellers, massage therapists, various sellers, and more. In photo are some of the MABOVEN members and officers joined by Globe Telecom President and CEO Ernest Cu and Mynt VP for Merchant Solutions and Sales, JM Aujero. GCash is the first mobile wallet in the Philippines to enable digital payments with its partners in Boracay, namely the Boracay Foundation, Inc. (BFI) and MABOVEN. BFI is a non-profit organization concerned at sustaining the island’s environmental, business, and social needs. MABOVEN on the other hand, is an association of vendors in Boracay. 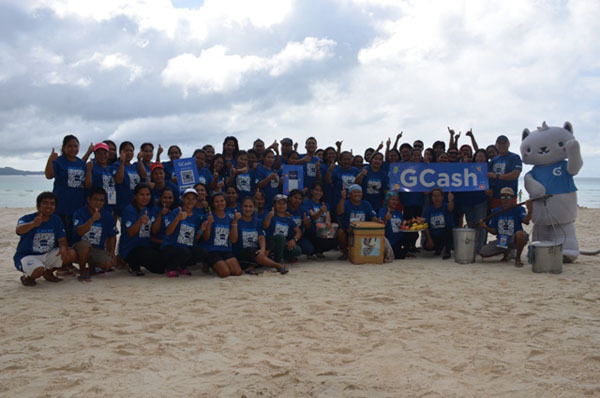 GCash teaming up with said organizations ensures not only a cashless ecosystem, but ensures a sustainable beach by reducing paper waste from receipts and reducing energy consumption by the island through scan to pay GCash QR transactions. There are currently over 400 GCash Partner Merchants in Boracay, and over 100 combined GCash-Alipay merchants in the island, the latter of which are ready for Chinese tourists with the Alipay App installed. Combined GCash-Alipay QRs ensure that tourists can readily transact with local merchants. 1st trust score in the Philippines. Pwede pala. Mynt takes the next big step in financial inclusion by making hassle-free loans available to every Filipino through its lending arm, Fuse, which primarily caters to the underserved and unbanked population in the country. Fuse offers GCredit and GScore for lending and credit scoring, respectively. GCredit is a credit line attached to one’s GCash account with funds they can then use to buy groceries, medicine, or even school supplies in partner merchants via GCash scan to pay. The amount they can avail of is determined by GScore, the first trust score in the Philippines which checks the financial capacity of an individual to pay back a credit based on their GCash usage. GCash is a mobile money service of Mynt. “We are committed to enable the aspirations of the financially-underserved. With Fuse, we aim to create and sustain opportunities for growth and stability for individuals and businesses alike through responsible and fintech-enabled lending,” said Anthony Thomas, president and chief executive officer of Mynt. GScore, Thomas said, addresses the difficulty of most Filipinos to access credit due to absence of formal documents that prove financial capacity. Instead, GScore provides a “trust score” that people can earn without too much barrier just by engaging in regular GCash transactions such as buying load, paying bills, purchasing goods and services, among other things. At present, many Filipinos have no other recourse but to turn to informal or unlicensed money lenders usually called “five-six” since they extend loans without collateral or documentary requirements. In exchange, they charge the borrowers exorbitant interest rates of 20 percent or higher, thereby, leading to a debt trap where people find it hard to break out of a borrowing cycle just to stay afloat. This situation could be avoided through GCredit. With GCredit, once a customer pays their credit balance, it replenishes instantly. This provides customers peace of mind so they can have access to funds whenever they have emergencies or life milestones. As added benefit, those who continue to use and pay their GCredit properly will be given higher GCredit limits. The Micro, Small and Medium enterprises (MSMEs) sector comprises 99.6% of all registered business in the Philippines, and employs more than 60% of the country’s workforce. Many of these MSMEs in the country are paying their employees’ salaries through check and is subject to cutoffs of banks for payroll disbursement. Most of them find it hard to comply with existing requirements for bank accounts and the requirement for individual documents. GCash is supporting the MSME Sector through its PowerPay+. It is a bundled funds disbursement facility that allows you to payout salaries, allowances, and commissions more conveniently and securely. GCash PowerPay+ will give MSMEs an access to an easy-to-use online portal for their quick disbursement needs. In fact, 200 microenterprises are currently with PowerPay+. GCash will continue to reach out to more MSMEs in the country come 2019. For more information visit gcashbiz.com and e-mail [email protected] for any inquiries on how to become a PowerPay+ MSME partner. So what’s next for the company? For one, the drive to financial inclusion will continue with more ecosystem building nationwide, coupled with more GCash merchants, more locations to put funds into your GCash account, and more features inside the GCash App. “The biggest competition of GCash is cash itself. Cash is still king in the Philippines currently,” said Thomas, regarding the company’s future steps. “We’re looking forward to a cashless nation in the next three to five years, and we aim to do it by improving our services better together with our partners from the Ayala Corporation, Globe Telecom, and Ant Financial, and educating Filipinos on how they can be financially included just by using the GCash App,” he added. Mynt, GCash, and Fuse have been leading innovations in the digital payments industry for the past three years. Among the company’s other accomplishments was being the first to utilize blockchain technology on sending money internationally. Follow our social media channels on Facebook. For customer support, visit facebook.com/gcashcare or send an email to [email protected] For promos, visit facebook.com/gcashofficial. GCash through Buy Load extended a helping hand to those of in need. With GCash helping is now easier with an application at your fingertips. In this digital age when Smartphones and IOS dominate the world , anyone from all walks of life can be an instrument of hope for those in need. GCash made helping effortlessly for everyone by simply downloading and using the GCash App. A dedicated GCash Quick Response Code (QR Code) will also be provided by Mynt for Lingkod Kapamilya which will be available in all participating stores nationwide and the ABS-CBN Compound in Quezon City. Free Pera Padala? Pwede pala with GCash. Can you imagine getting charged a PHP 250 money transfer fee when sending PHP 10,000 to a kapamilya or a loved one located in another region in the Philippines? That’s what traditional remittance centers are charging Filipinos for every “pera padala” transaction they’re doing. Fees for electronic transactions that costs little to absolutely zero at all to operate should be free. If you have a phone – be it a smartphone or a bar phone – you can use GCash to send money for free. This way, you’ll be able to avoid exorbitant rates being charged by remittance centers. Aside from sending money to your kapamilya in the province, GCash is also perfect way to receive money for payments if you’re a freelancer or an online store selling apparel, shoes, or what have you. A lot of Instagram sellers are actually accepting GCash payments for their goods and then cashing-out later, since banks ask for a lot of documents and take too long to set up. Pay at Lazada with GCash? Pwede pala. “Being able to shop online using the GCash App solves two problems, mainly providing access and convenience to consumers to shop online without a credit card, and enabling merchants to expand their consumer base and minimize risk on COD transactions,” said Anthony Thomas, Mynt’s President and CEO. “This goes back to our journey for financial inclusion. Now, no matter how small or big a Filipino is, he or she can enjoy Lazada goods and services via GCash,” he added. Mynt is the operating company behind GCash. GCash and Lazada are currently holding a promo where a GCash customer can win their own condominium unit by simply entering the code “GCASHCONDO” upon checking out and paying with GCash. QR Code Payment via Facebook Messenger? Pwede pala. When GCash introduced the QR payments technology to the Philippines last 2016, it mainly marketed usage via the GCash App. Customers who download the GCash App can just log-in and tap on the “Pay QR” button to be able to scan to pay. But with the most recent update, the company once again revolutionized the local digital payments scene by being the first to integrate QR payments into the world’s biggest and most popular chat app – Facebook Messenger. QR technology is big in developed Asian countries like China, where people are used to QR payments using their smartphones via apps like Alipay – a leading Chinese mobile wallet with over a billion users. 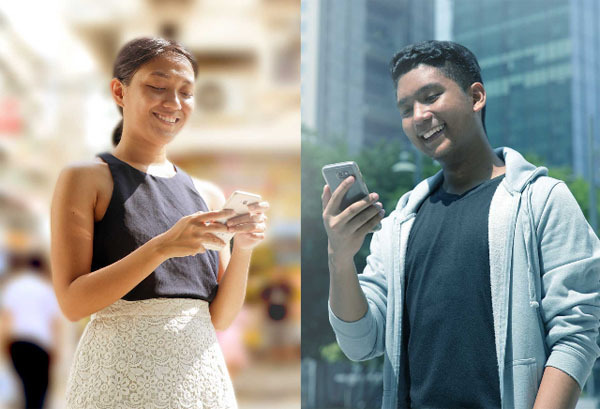 With GCash’s expansion from app-only QR payments to include Messenger App QR payments, it aims to acquire and educate the chat app’s 54 million user base in the Philippines. 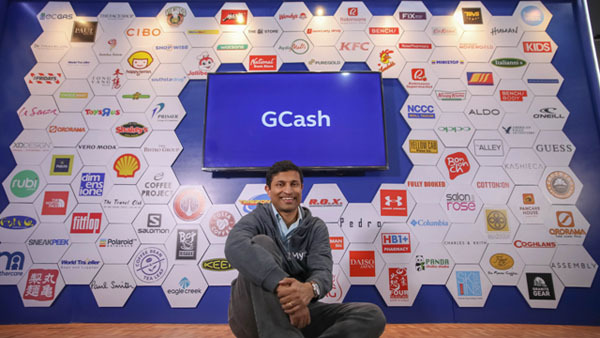 “We believe that the partnership with Facebook Messenger will help GCash in two prongs: one is to educate and familiarize more than half of the Philippine population on what QR technology is and its role in payments, and the other one in enabling the financially underserved, since customers can also do other GCash transactions in Messenger, some of which are the Buy Load and Send Money services,” said Anthony Thomas, President and CEO of Mynt. “And since Messenger is free to access on most telco networks, I’m inviting people to search for our official GCash account and register for them to be able to enjoy discounts and promos,” Thomas added.